You hear about these on 4WD forums occasionally, but very rarely do you hear an Aussie who owns and uses one talking about them. I own one so here goes. The Poms seem to love these bell tents. They are a common sight at festivals and "glamping" resorts and they are becoming more and more common in the Land of Oz. Their lineage dates back to the Sibley tent used by the British during the Crimean War of the 1850s and they remained relatively unchanged in military service until the 1950s. Sometime in the early 2000s they became cool and a whole bunch of manufacturers started pumping them out - in China. Aside from one mob out of Scandinavia, and a canvas goods place in NZ who make their own, the various sellers like Psy Clone, Soul Pad and others all have their tents made by the same factories in China and they just chuck their own brand on the tent. They come in sizes ranging from 3m to 6m diameter. Some have a sewn-in groundsheet, others have a peg-in-or zip-off heavy PVC groundsheet. Some come with a zip up mozzie net at the doors and some don't. Some have a stove pipe jack for use with a wood stove (a useless feature for most of Australia). The tent is held up by a single pole and a bunch of guy ropes. The 4m version weighs in at around 25kg. Sure, they look all pretty when glamped up, so your missus would probably love one, but are they even workable as an option for touring offroad? A couple of years back I spent six months evaluating a 4m one from a mob in Sydney. It went on a number of trips, from campgrounds to remote area campsites out west - even a canoe trip. That tent endured rain, thunderstorms, hail, high winds and weeks of harsh Aussie summer sun. 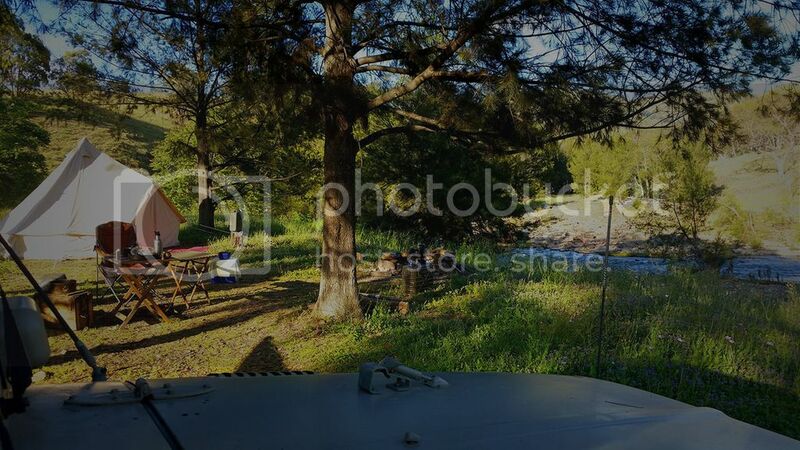 Last year I bought my own and have used it a few times on fossicking and 4WD trips. No leaks - even after a week's non-stop rain. The only water came in when I opened the door and it dripped off me. The groundsheet forms a 15cm high "tub" to keep water from running in through the groundsheet zippers. Speed of pitching - The sellers reckon anywhere between 10 and 20 minutes to pitch. I've got it down to between 7 and 10 minutes (by myself). Peg out the groundsheet, throw up the central pole and the door frame then peg out the side guy lines. It doesn't get much simpler than that. Interior space and head room - Unless you're an 8 foot giant you can stand completely upright in one of these tents. My 4m model can fit in a queen sized air mattress. There's still room for your packs or bags, a couple of chairs and a folding table too. It will easily accommodate six people with room left over for gear. Light - this might be a con to some folks, but I like the natural light let in by the canvas. Of course, being a light colour the interior of the tent can be lit by single small light source at night too. I usually hang a UCO candle lantern from the D-ring on the pole. Resale value - These things are loved by all manner of eco-warriors, hipsters, Instagrammers and others. Keep it in good nick and you'll be able to flog it off for nearly as much as you paid for it. Bulky and Heavy as - this tent is a bit too big to be carting across the country in my soft-top Shorty Forty since it takes up so much space in the back. I have a few ideas on how to resolve this though, the most workable being to make a new lighter weight groundsheet from 12oz canvas and waterproof it completely on the underside with ye olde DIY roofing silicone/white spirit proofing compound. The PVC groundsheet which comes with the tent must weigh almost 10kg by itself. Replacing the PVC groundsheet with a lighter canvas one will reduce the bulk as well, maybe by up to a quarter. Space required to pitch - If you're pitching a 4m bell tent then you need a minimum of about 5.5m diameter space to pitch the tent and peg out the guy lines. While it's a lot more space than you need to set out a couple of swags, it shouldn't be too hard to find the space if you're vehicle-borne. Care needed - It's canvas and it's light-coloured, so unless you look after it you'll start getting mildew problems. As with any canvas never pack it away while wet. I reckon they are a pretty decent option and they aren't nylon. I'll answer any questions about them as well as I am able. Heya, don't know your name, so that will have to do. I expect 2 poles, large centre one and one for the front door pitch ? Separate inner / outer fly ? Imagine so. I can see a set up (proper / full setup) of a good 30 mins at least, even if used to it, but nothing wrong with that for base camping. I used to own something similar, was longer that's all. It was a fairly good early tent for family trips camping, until it outlived our need for it. Being a cheaper nylon type tent, it just gradually became less usable the longer stored, and only just recently gavce it to family member to use for their first camping trips with their young daughter . . . it will do them for a few early camps to get the feel for going outdoors anyway. We don't do the base camp thing much, but for those that do these could be a good option to consider. If spending upward to $1000 though, most would just go Oztent, Blackwolf Turbo, etc. Thnaks for posting, reviews are a great way to see new things, and get some ideas. By the way I've never heard of the roofing silicone / spirit waterproofing, what is the recipe / application method ? Ian, this is a common method for bushwalkers to seamseal (or re-seam seal) tents . . . you just use neutral cure silicone (usually translucent) and mix with White Spirits (Shellite) to a usable brush on mix, then brush along onto seams of a tent (from the inside). It mixes readily with a wooden stirring stick etc. I imagine to proof a full sheet of canvas, you would go very thin as you'd need to put through a spray gun, hang it up and give it a couple of alternate directions of coating, and I imaging this would also be best done on the inner surface. There's one central pole and an A-frame over the doors. It's a single layer canvas roof. Yeah, nah. I properly pitch the tent in under 10 minutes, having had a lot of practice. The manufacturers reckon up to 20 min set up time, which I guess is for the lowest common denominator. It's litre of white spirit (not shellite - that's what the yanks call "white gas" - common mistake), or even turps if you like the smell, to a 310g tube of roofing silicone. Mix in a bucket with a stick until the silicone has all dissolved. I paint it on with a brush for best results. One coat will do for most applications as long as it's thorough. Could use a paint roller too, but I've never tried it. Black silicon works also. This stuff can be used to (completely) waterproof a canvas groundsheet like the one I'm talking about by siliconising it, or the stuff can be used as a general seam sealer. If you make it up and store it in an airtight jar or tin you only have to make it up once. The white spirit evaporates out leaving the silicone impregnated in the fibres of the canvas. For sure a single layer tent would be faster, it looked like it had the usual inner / fly setup, though even if it did, there are many tents that do pitch integral. A single skin tent might get condensation problems with a 'full house' of occupants overnight in still air, but if circulation is ok, should flow through the vertical vents ok. I use a Black Diamond Megamid (which is a 4 sided single skin, no floor shelter for bushwalking) when we do group walks . . . most of the time there are 4 of us on the 10' x 10' square footprint, and it does get condensation at times, you just need to use it right to get by ok.
Trust me, shellite / white spirits / white gas / coleman fuel, and occasionally naphtha (kero) are all the same product. I don't want more than 4 pegs on any Tent I take on trips (Unless it rains) & I need a Masonry Drill to put the Pegs in at times. Unless you stay for some time in one spot the must have is a quick setup, particularly if your moving nearly every day. The Poms can keep them. Kero is very different to both. Hi Bill, there may be slightly different properties of each in their production, but Shellite and silicone is the bushwalkers mix for seam sealing and I have used it for non slip surface in very lightweight tents too, as light brushed lines across the floor. They all burn similarly in petroleum based fuel stoves, just Shellite / white spirits burns cleaner than unleaded or kero. I'll just see what I can find on this, hang on . . .
A couple of links . . .
Point is they can all be used to thin neutral cure silicone for seam sealing, and if suggested by OP as a spray on waterproofer, then when thinned enough to go through the spray gun tip. I've never used it for this, but it would work ok I'm sure. There might be cheaper, easier to use products off the shelf though, to use for spray on waterproofing of canvas / cotton, etc. I use a Pop Tent & Awning if needed on long trips of a Month or so as I did in the last 2 years with no pegs (Tie it to the fourbie if it gets windy) but If Olga comes & "Rough it" I use the luxury model with 4 pegs. 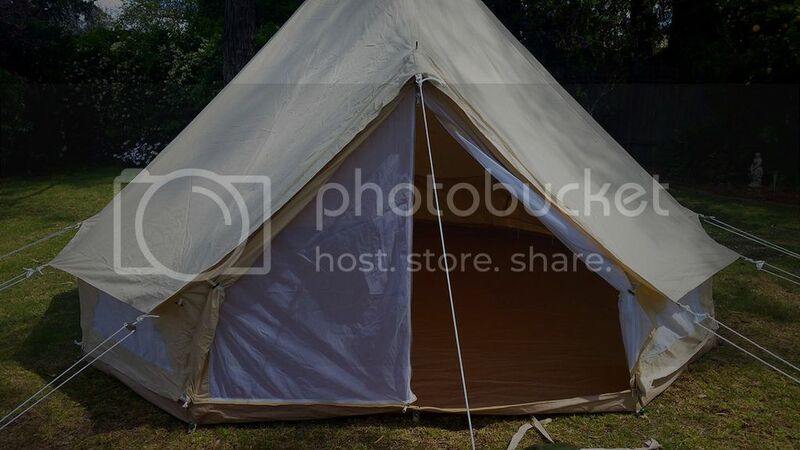 Wifey has one and it is a great family tent for staying in one area for an extended period; but I wouldn't want to be putting it up every night when I can just roll out a swag. They are very spacious, we can have a queen bed, plus the child and still have plenty of space to play indoors if the weather is bad. You can stand up inside and and rolling up the walls makes it as breezy and cool as a tarp in hot weather. Provided it is pegged down well, it holds securely in strong winds, the round shape helps by not catching the wind as much as flat shapes. The bulk and cost is on par with any other canvas tent of comparable size, the Chinese versions use a different canvas and are cheaper (and I think they are all made there now anyway). The coat-hanger gauge pegs as supposed are more suited to gentle British fields than our hard earth, so they got upgraded right away. I really like it. A time of rest before the shitstorm. Those tent pegs are nice and solid. Yeah and nice white rocks forming paths that would be visible in low light. No LED head torches then all right, maybe a candle.